GUEST BLOG / By Trudy Lieberman, Columbia Journalism Review--Who or what was responsible for the failure of the Republican push to replace Obamacare? A president powerless to back up his claims of being a master negotiator? A House speaker unable to corral the disparate wings of his caucus? A bill itself that proved exceedingly unpopular to the majority of Americans? All of the above certainly played a role, but CJR’s Trudy Lieberman argues for the influences of another actor: local news. “The GOP’s decision to pull the American Health Care Act, which would have repealed most of the major provisions of Obamacare, reflects in no small measure the groundswell of opposition from local news outlets,” Lieberman writes. 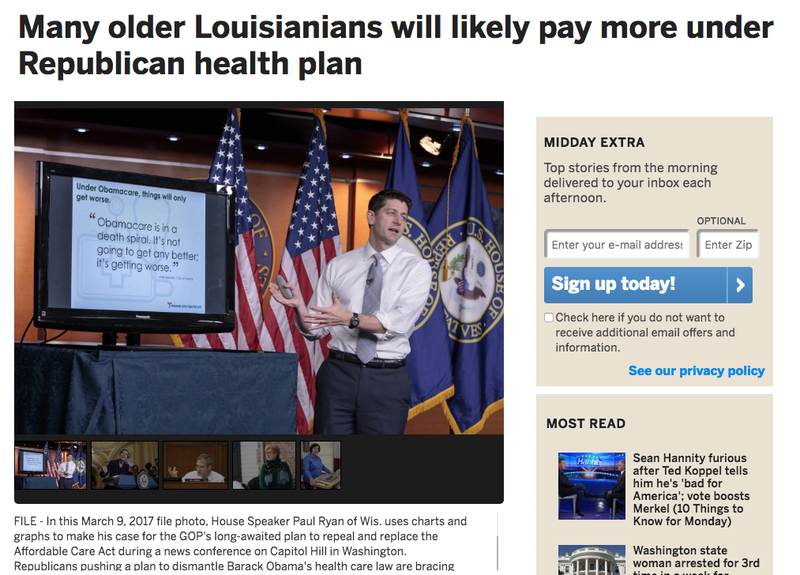 Cataloging opposition to the bill in newspapers and local television reports from Trump-voting states including Louisiana, Michigan, Virginia, Montana, and others, Lieberman finds a mixture of editorials and reported pieces that stirred up objections to the impact the AHCA would have on local communities. While national news centered on Washington infighting and headline numbers, these local outlets brought the story home to their audiences by focusing on the specific implications the bill held for their communities. During a week in which it was easy to get caught up in cable news coverage and factional battles in DC, Lieberman reminds us that local news retains its influence. Below, a brief roundup of some great local reporting, on healthcare and beyond. BillingsGazette--Impact of Native American communities: The Billings Gazette’s Jayme Fraser examined how the loss of Medicaid coverage would affect Native Americans, nearly 10,000 of whom had signed up for coverage under Montana’s Medicaid expansion. Baltimore Sun--De facto segregation in education: For The Baltimore Sun, Erica L. Green finds “a de facto system of segregation,” even within schools that appear to be integrated. Cleveland.com-Expanding the map in Ohio: After the 2016 election, Cleveland.com took stock of its failure to foresee the groundswell of support for Donald Trump. CJR’s Jackie Spinner reports that the result of that introspection is a new project, “Ohio Matters,” which aims to expand the map of coverage in an attempt to better understand the state as a whole. Press-Herald-Covering the opioid epidemic: The Portland Press-Herald’s Eric Russell has a deeply reported investigation into the opioid crisis, which led to an all-time high in overdose deaths in Maine last year. Times-Herald--Police accountability: From Jacksonville, The Florida Times-Herald’s Ben Conarck continued his investigation into police practices, reporting that the sheriff’s office spied on protesters in 2016. Columbia Journalism Review--Journalists demand transparency from the subjects they cover, but when Farai Chideya set out to investigate diversity statistics of political coverage around the country, she found newsrooms unwilling to speak with her. Go to CJR for Chideya’s plea for openness. Washington Post--The Post’s Margaret Sullivan says CBS Evening News anchor Scott Pelley is “abandoning careful neutrality in favor of pointed truth-telling,” and viewers are taking notice. Alan Jones Apology-After months spent hyping the baseless “Pizzagate” story, conspiracy theorist and toothpaste pitchman Alex Jones offered a carefully worded apology that seemed aimed at heading off legal action.